GODAE OceanView coordinates the development of new capabilities through active working groups, the GOV Task Teams (or TTs). These teams focus on a number of different topics relevant to GODAE OceanView and the wider ocean science communities. Cooperation with international research programmes and expert groups underpins the GOV effort and provides societal benefit. The GODAE OceanView task teams are co-chaired by experts in the respective fields of sience. All task team co-chairs are members of the GOV Science Team (GOVST). The GOV task teams have set up TT activity plans which are being updated regularly, complementing the GOV Strategic Plan. 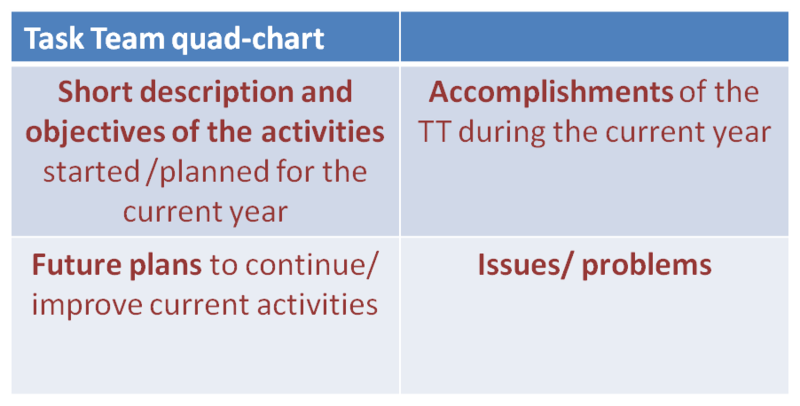 An overview of the tasks and achievements of the TTs have been summarised in the TT quad-charts which highlight the short-term activities (annual) addressing TT-related topics of particular importance to GOV. The GOV Task Teasm are supported by members of the GOV Patrons Group with regards to TT strategy, decision making and funding questions.